Had this one in the to-do pile for a long time now… excited to share this fun embellishment with you! I had planned to do a heart appliqué sweater with this great hot pink knit leftover fabric I had from a vintage skirt… I imagined doing one of those J.Crew heart sweater looks, big, asymmetrical heart appliqué on a nice crewneck sweater. And out of hot pink? Perfect, and a cute Valentine’s Day craft. But I wanted to do something a little different when it really came down to it. I thought about doing a big bow shape out of the fabric, laid flat, but I already did a DIY bow appliqué tee once, and… nah. My mom suggested an anchor. Great idea, Mom! Even a couple tees and sweatshirts like mine! 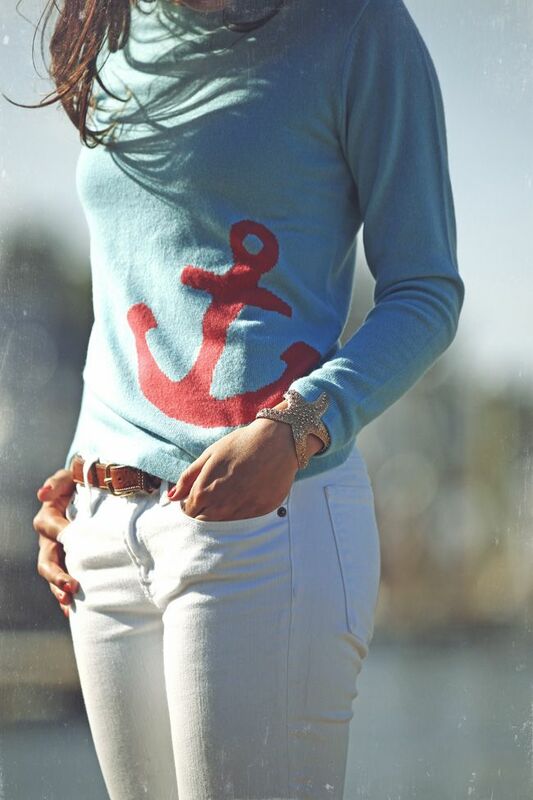 Anchor pattern! Or any pattern you want. I found this anchor template and printed it out, scale up big to fit an 8.5”x11” page. You could do any size! Optional: Fusible interfacing to put on the inside of your tee, if it’s very stretchy, or on the underside of your appliqué fabric if it’s very thin. I didn't use it this time! 1. 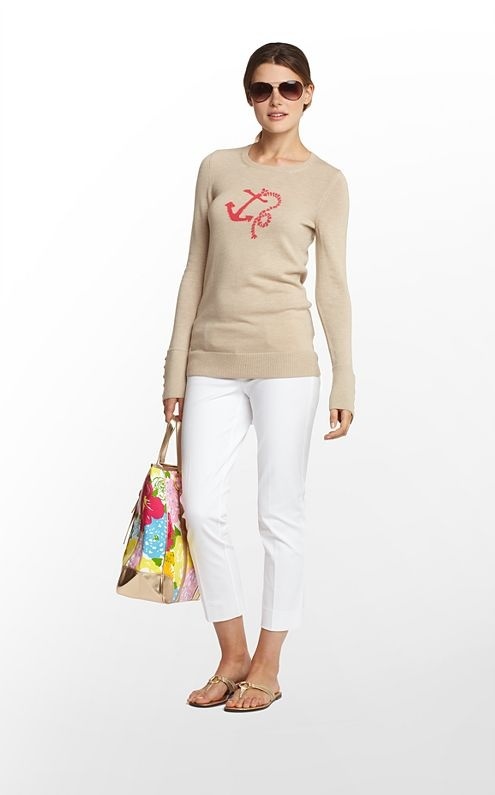 Print and cut out your anchor pattern and spray some spray adhesive to the back of it. Stick the sticky side to the back/underside of your appliqué fabric, keeping your fabric on the grain--that is, don't put the pattern down any which-way, and let the center line be straight along the grain/weave of the fabric. This will keep it from pulling and getting distorted as you stick and sew. 2. Watching the center line of your tee (see the pins that mark mine? ), press your sticky appliqué down. This was easy on the stripes, since they act as guides to keep it straight! Sooo cool! I absolutely love it! Awesome! I have a ton of striped garments that I need to refashion. There's a great men's sweater I picked up for $1, that I can't quite decide how to handle. It has the greatest pattern though! Do you think I could ask you in a reader question about this in the sewing circle? I know it's not figuring out a pattern from a dress, but it's a question that I can't answer by myself! 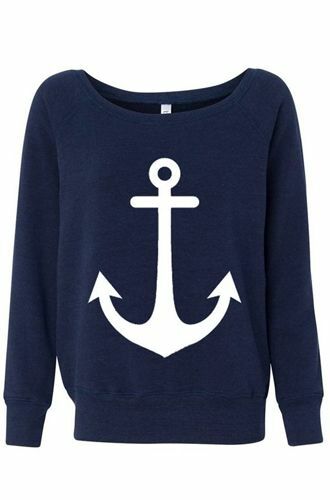 Really cute, the anchor was a great idea. Way to go mom! This is great!! I want to do this next weekend! This turned out great Suzanne! I love graphics on stripes, and did you know Ann Taylor Loft is featuring bold color sets in their spring line, and one of their sets is navy and white stripes with hot pink! It is so hard to avoid puckering in applique projects. I highly recommend using a tear away stabilizer. You just iron it to the inside of your shirt where the design is and after appliqueing you tear it off. Also, if you have an adjustable presser foot on your sewing machine, loosen it before zig zagging on the applique. oh this is super cute! It has me wishing for spring and summer! Very cute! Makes me feel spring is nearly here! Also, I love that mirror, may I ask where you bought it? Thanks! It's from Target but I got it at Goodwill.